As an online supplier dedicated to offering the best electronic items to the world, Chinavasion also works hard to promote the “made in China” brand. With abundant raw materials and labor, China is able to produce quality electronics at relatively low costs compared with the international market. And what Chinavasion.com tries to do, is to introduce these great items to other countries, especially to those where electronics are very costly like the United States. A deep investigation into this China shopping website reveals that every electronic item offered on Chinavasion is made in China. Buyers should note that before you sign up in the website, the price you see for each item is only for 1-6 units per order. After you sign up, you will see the different wholesale prices for larger quantities. This is a typical feature that can separate Chinese wholesale oriented stores from the retail oriented ones. When you see a China shopping site lists products at different prices depending on quantities, it must be a wholesale shop although it may also take retail orders. The bigger your order size, the lower the wholesale price you can get from Chinavasion. In addition to the labeled prices you can see on the items, you can also negotiate with them for a better price you want. Also, based on order history, old customers will be rewarded with better discounts for single pieces in drop shipping service. Unlike other Chinese global stores, Chinavasion.com does not revamp its homepage layout frequently. It remains almost the same as how it looked years ago. Of course, its product range and catalogs are being constantly upgraded with more and more cool gadgets added. For instance, now remote control toys like RC helicopters have become one of the bestsellers at the site. The other evidence showing that Chinavasion.com is different from the traditional online Chinese shops is the obvious Chinese flavor the site is polished with. From the top banners to the live chat icon, you will see all Chinese faces if needed. Just pick any other Chinese international shopping site and you will see all Western faces. 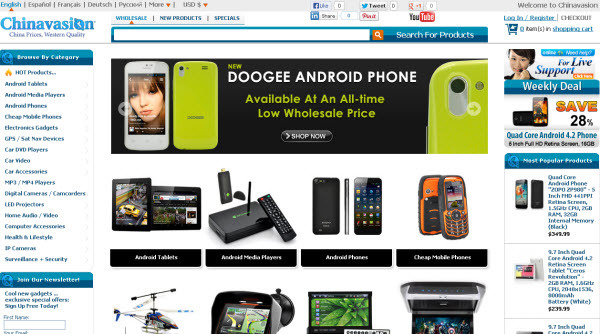 It seems the site is always trying to tell its customers directly that it is a Chinese store. Remaining honest is a precious quality or attitude. I personally love it very much. Where to Buy Wholesale USB Gadgets from China?